Top O' The mornin to ya ladies! It has just ticked over into Saturday which means it's St Patrick's Day today. 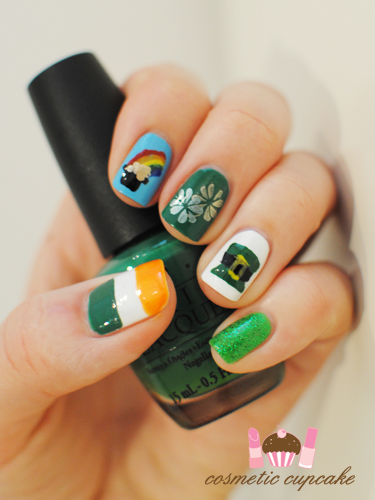 I don't celebrate but you know me - I just had to get into the spirit and do a St Patrick's Day manicure! Pinky: I used 2 coats of Essence Check Me Out as my base and the best St Patrick's Day glitter EVER - Color Club Object of Envy* which I used last year for my mani (fully swatched here). 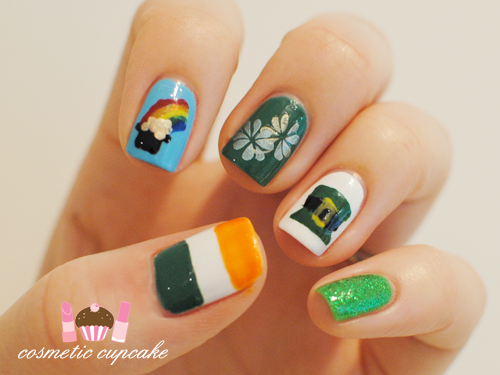 Ring finger: A leprechaun hat! 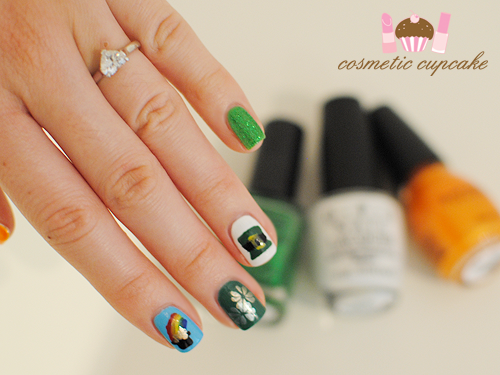 I used 3 coats of OPI Alpine Snow as my base and Nail Star Two-Way nail art pen & brush in green to freehand the hat. For the black band I used Kiss nail art paint striper in black and the yellow buckle is done using China Glaze Happy Go Lucky and a small nail art brush. The hat on my right hand is BETTER than my left. Go figure! Middle finger: I used 2 coats of OPI Jade is the New Black and stamped shamrock-looking design from fauxnad plate B45 using China Glaze Passion and Metallic Muse. Index finger: A pot of gold!! I started off with 2 coats of Barry M Blueberry ice-cream as my base and for the pot I used Kiss nail art paint striper in black. For the rainbow I used Nail Star Two-Way nail art pen & brush in red, green and blue and Sinful Colors Cloud 9 and China Glaze Happy Go Lucky. The coins are done using China Glaze Passion and a small dotting tool! 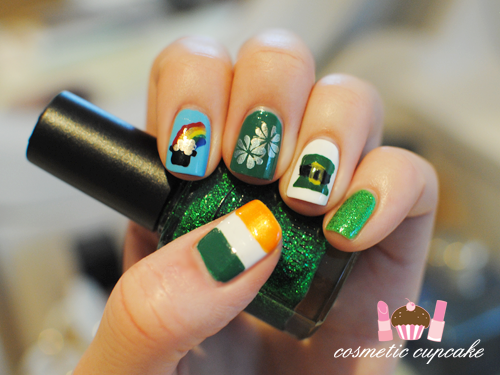 Thumb: Irish flag! I used 3 coats of OPI Alpine Snow and then freehanded thick stripes of OPI Jade is the New Black and Sinful Colors Cloud 9. Yay! Cute skittles! :) I LOVE your pot o' gold! Thank you!! I'm really pleased it turned out actually! I love shamrocks :) happy St. Paddy's day ! Slainte!! 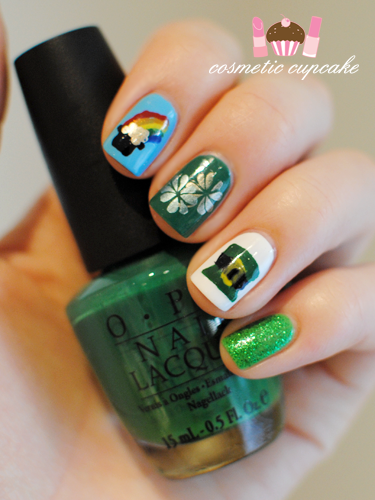 I thought of doing a shamrock (but didn't cos I'm no artist). That leprechaun hat is fantastic! This is so amazing! 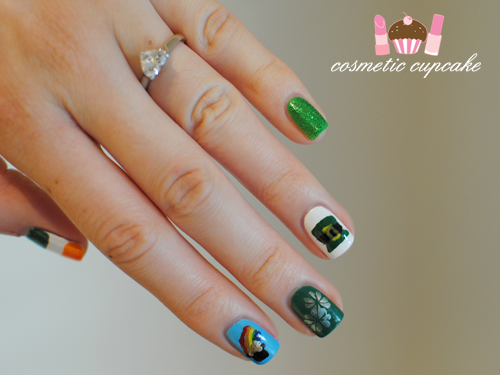 Congrats on doing such a great St Paddy's manicure!